I don’t know whether Canadian hockey fans truly appreciated the mission of mercy that Batten and his editors undertook on their behalf at Maclean’smagazine nearly 50 years ago, or whether they only indulged it as an entertaining lark. To spare the faithful the time-consuming and oh-so-stressful trouble inherent in following a season’s worth of NHL hockey, Maclean’sdecided they’d get in ahead of the season and ask a computer to figure out how it was all going to play out — a “$500,000 computer,” no less. If this seems all very Stanley Kubrick, well, it was 1970, a mere two years after 2001: A Space Odysseymade its debut in movie theatres. 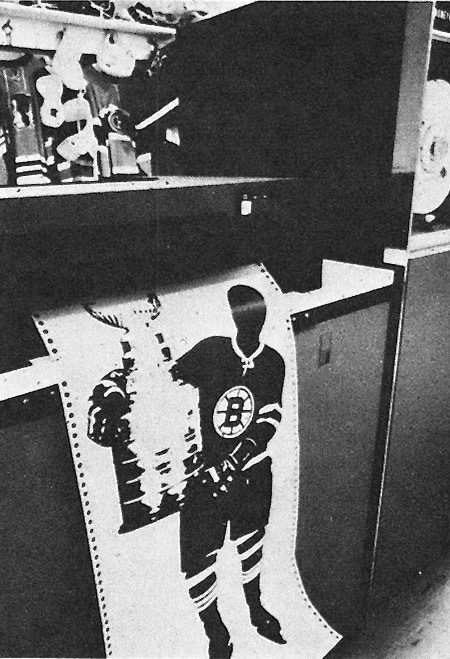 Looking back, the magazine’s “bloodless and coolly scientific” effort to determine just how the 1970-71 NHL season would end might be best remembered as the novelty act it was. But it also offers a fascinating glimpse into the state of NHL stats at the time, and just how fancy they were getting. Leaving the pundits to muddle in their guesswork, Maclean’sarranged early in 1970 to gather up a pile of NHL statistics from the ’69-70 season and drive them out to Scarborough, Ontario, for a visit to the offices of Honeywell Controls Limited, then billing themselves as “The Other Computer Company — or, as Batten puts it, Avis to IBM’s Hertz. How big a pile? “A staggering load” is Batten’s measurement. For these raw numbers, Maclean’slooked to NHL statistician Ron Andrews, not a household name, to be sure, but an important one in hockey history. 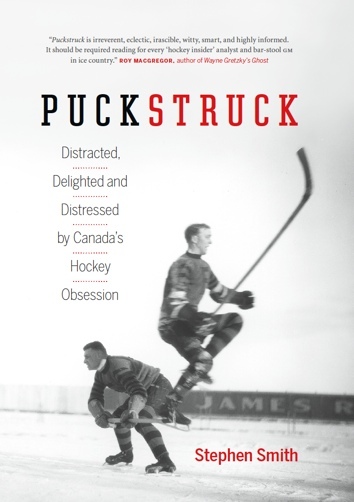 A former Canadian Press reporter with (as Batten puts it) a “special numerical curiosity,” Andrews was digging deeply into the numbers the game generates and thinking about how they might be used to analyze how it’s played long before NHL President Clarence Campbell hired him in 1963 to collect and organize the league’s statistics. Calling him Andrews a pioneer of plus-minus may not be the compliment it once was, but no-one did more to build the foundation of hockey analytics than he did. With his 1970 Maclean’scameo, Andrews, who died in 2003 at the age of 67, offers a view into the sophistication of his operation — including a list of 22 offensive categories, “not all but many” of those he and his hunter-gatherers around the league made it their business to track for each NHL player. Uh-huh, says Batten. Who doesknow how to read them? Honeywell’s was a Series 200 Model 1250 — “called Foster by its friends,” Batten writes. 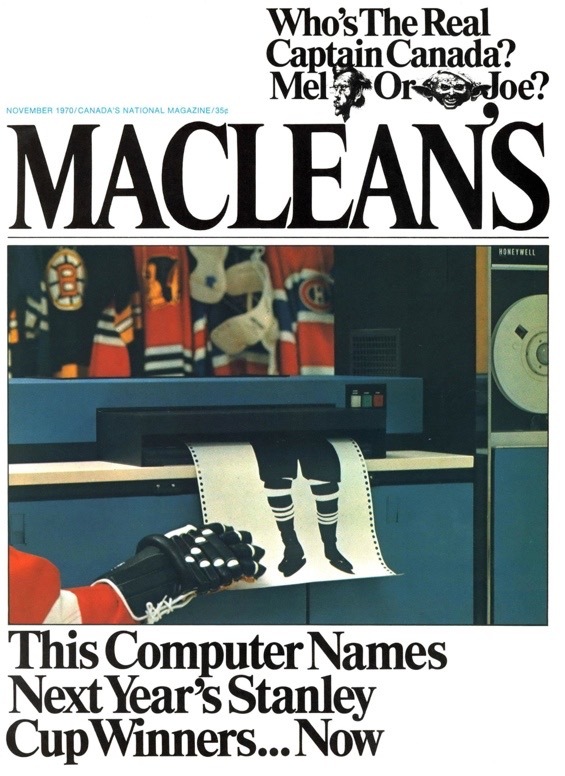 The company had a crew of three assigned to the Maclean’sjob, including a forecasting expert and a programmer responsible for loading the NHL’s hockey data onto punch-cards to feed to Foster. When all was said and done — once Foster had “memorized, digested, juggled, and computed the data” — by then, it was “a bright afternoon early in September,” and the computer “presented on its spinning tape a scientific view” of how the season ahead would unfold. Foster’s regular-season forecast had Boston finishing first in the East, followed by Montreal, while in the West Chicago would prevail ahead of Minnesota. Eastern teams had swept past their western rivals three years in a row to win Stanley Cups in the late 1960s. In a bid to make the upcoming ’70-71 finals more competitive, the NHL rejigged the playoff format to bring eastern and western teams together in the semi-finals. With that in mind, Foster saw Boston ousting the Minnesota North Stars at that point, and Chicago bettering Montreal. It wouldn’t last against Boston, come the finals. The Bruins, of course, had won the Cup in 1970, with Bobby Orr and Phil Esposito and Johnny Bucyk leading the way. They’d do it again in 1971, Foster felt. History, of course, gets the final say. It shows that while Boston did in fact finish top of the 1970-71 NHL regular-season standings, the Bruins foundered early in April when they ran up against a young goaltender named Ken Dryden in the first round of the playoffs. Having adjusted Boston’s and Foster’s programming accordingly, Dryden’s Montreal Canadiens went on to defeat Minnesota and Chicago to win the Stanley Cup they couldn’t convince Honeywell to hand over.